It would not be a stretch to say that "Common Destinations: Maps in the American Experience" exists by popular demand. The curator of the exhibition, Martin Brückner, is a literature professor at the University of Delaware who in 2006 published "The Geographic Revolution in Early America: Maps, Literacy, and National Identity" and thought he'd never touch maps again. He turned instead to the literature of the Enlightenment. But, Mr. Brückner said one recent day at Winterthur, where the exhibition opens on Saturday, "I kept getting invited to map conferences, and people would come up to me and say 'I love maps.'" They would tell him stories—that they collected maps of the Grand Canyon because they had honeymooned there, say. Many would recall fond memories with maps as schoolchildren. Struck by their deep feelings, he said, "I did a complete 180, and decided to stick entirely with maps." Since previous scholarship had focused largely on the great mapmakers or on the decorative aspects of maps, Mr. Brückner zeroed in on "the social life of maps." His research led him to Winterthur, among other cartographic repositories. There, Linda S. Eaton, the director of collections, asked him to turn his work into an exhibition. The show he organized draws almost entirely on Winterthur's collection, most of which has rarely if ever been on view. Dating from 1733 to the 1870s, and ranging from the hand-drawn to the mass-produced, the specimens aim to illustrate the prevalence of maps in daily life as the U.S. became a nation. The men who built roads and canals used them, of course. But so did men, women and children who saw maps as conversation pieces, educational tools, game-playing prompts and decorative items. Mr. Brückner, in what he calls his unstated "subversive narrative," also believes that slaves had access to maps of their owners. That is contrary to lore suggesting that slaves made their way north on the Underground Railroad without much navigational help. But it's shown in such pictures as "The Washington Family," a 1798-1805 painting by Edward Savage that depicts the first president, his wife and his two step-grandchildren viewing a plan of the District of Columbia, with a slave looking on. Visitors to "Common Destinations" may be surprised to see much more than paper items. There are maps on ceramics, playing cards, pocket globes, powder horns, silk handkerchiefs and even a lady's fan. "I have never seen another," said Mr. Brückner. "It's unique." 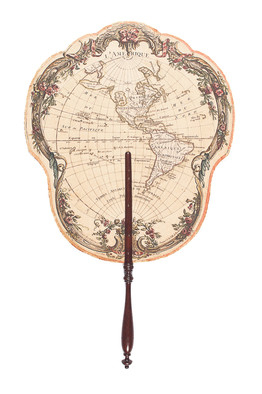 Made in France and dating to 1779-80, this fashion item—a colored engraving of the Americas, framed in brass and with a wooden handle—is an example of a "cartifact," maps on window shades, figurines, gloves, neckties and other items that have no real cartographic purpose. That fan testifies to another fact: Initially, almost all maps were imported, including the vaunted Popple Map, which opens this exhibition. 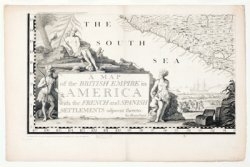 Dated 1733, titled "A Map of the British Empire in America," it was printed in London. "Everyone knew it had mistakes, especially in the hinterlands," Mr. Brückner said. Some were "really bad," such as an invented plateau west of a misshapen Lake Huron. But it was the first large-scale map of North America. Everyone bought one (or more), including Benjamin Franklin, who hung one in his print shop. On seeing a Popple Map in the Pennsylvania State House, John Adams wrote "It is the largest I ever saw" to his wife, Abigail. Soon after the revolution, an American map-making industry developed, largely centered in Philadelphia, Mr. Brückner said. In the meantime, Virginia requisitioned them to give to its officers. Commonly, that meant "A Map of the Most Inhabited Part of Virginia" drawn in 1751 by Joshua Fry and Peter Jefferson, a surveyor who fathered the third president, and very plain, except for its cartouche. The one on view was engraved in London in 1775. Moving beyond maps that were important to officialdom, Mr. Brückner picks out another plan of Washington, this one of beautifully stitched silk embroidery on linen, made by Elizabeth Graham of Baltimore and dated 1800–03. "I'm blown away by the labor it must have involved," he said, noting that it was probably a school project. Nearby is a little orb made of blue silk and wood. It was embroidered around 1815 by Ruth Wright at a Quaker school near West Chester, Pa., that made needlework integral to geography lessons. 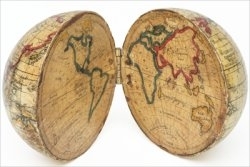 Wright's sampler globe delineates the continents, countries and oceans in ink, but the equator and arctic circles are stitched in white silk and the Tropics in red silk. Perhaps the star of the exhibition—Mr. Brückner calls it the holy grail of map-collecting—is on loan from Barry MacLean, a Midwestern industrialist: "A General Map of the Middle British Colonies," 1755, drawn by Lewis Evans. Highly accurate, it was used as "the yardstick to describe the Mid-Atlantic area," Mr. Brückner said, and was a spur to westward expansion into the Ohio Valley. This copy, printed on raw silk, is perhaps the only hand-colored copy in existence, Winterthur says. Another major treasure in the exhibition, "Wisdom Instructing Youth in the Science of Geography," about 1800, was purchased by Winterthur just this year. In this rare, silk allegorical embroidery, Wisdom watches over four students viewing a large unframed map and points to a classical temple, signifying the importance of maps in higher learning. Along with the maps, Mr. Brückner has provided a few paintings, period furniture, a surveying compass, a sewing roll and other objects to reinforce his theme that "everybody was interacting with maps in some form in their daily life." Near the end of the exhibition, he quotes Ralph Waldo Emerson in 1865, post-Civil War: "In every house and shop, an American map has been unrolled, and daily studied, and now that peace has come, every citizen finds himself a skilled student of the condition, means, and future, of this continent." The point, Mr. Brückner says, is that "maps can ground us, as a nation."